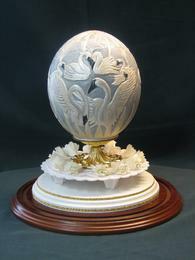 I offer Carved Egg Toppers that are as unique as the cake it embellishes. The highlight of any reception is first the guest of honor and second the cake. 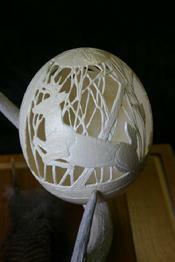 Let me help you make it memorable with a one of a kind carved egg topper with your choice of design. Egg choices are Ostrich, Emu, Rhea, Goose and Duck. We will work together to create a piece of art for your event. Designs are only limited to your imagination. This wonderful creation will adorn your showcase for years to come as a wonderful memento.